DR. DUKE ON NH1 NEWS! Voted Portsmouth region Number One Chiropractor! 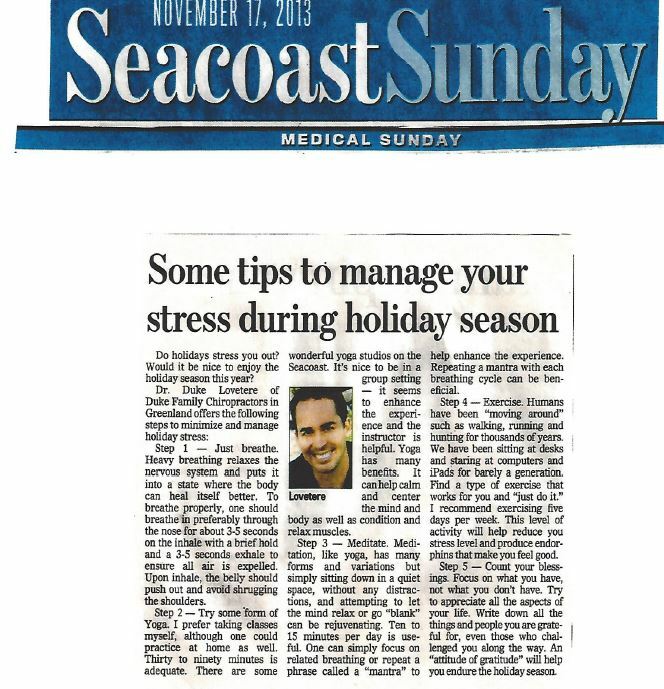 Voted Stratham and Exeter regions BEST Chiropractor! Exeter Area Chamber of Commerce! GREENLAND - Understanding the advantages to chiropractic treatment first-hand, Dr. Duke Lovetere of Duke Chiropractic said, he's spreading that knowledge to help others get well. As a high school student, Lovetere received a football injury that left him with headaches, sinus and digestive problems and allergies. After trying medications that didn't work, Lovetere turned to chiropractic care. Several visits later, his problems subsided. "It changed my life," said Lovetere, who decided then that chiropractic care and helping people to feel better would be his future career. "You're changing lives. It's incredible. Like you're on a mission - it drives you." It's the ways Lovetere and his colleagues at Duke Chiropractic have helped the community, as well as their passion for chiropractic care, that earned the office a 2010 Business of the Year honor from the Exeter Area Chamber of Commerce in the health care category. "It was a great honor," said Lovetere, who thanked his staff. While he's grateful for the award, he said the real benefit of it is more awareness about chiropractic and getting people into the office so they can get well. "My wish is to help people. I remember being sick myself, and my passion is to help people live as productive a life as possible without drugs and medication," he said. Duke Chiropractic takes a corrective chiropractic approach, Lovetere said, which leads to a more permanent solution for patients. He said chiropractic care can be used as an alternative to surgery or medication for many issues like allergies, asthma, autism and learning disorders. "Let's try and make a correction instead of adjustments here and there," he said, adding solutions may include nutritional or other lifestyle changes. "We fix these problems more long-term. It's a life-changing thing." Duke Chiropractic also offers a massage therapist and hypnotherapist to complement the chiropractic care, Lovetere said. "Most of these problems can be prevented without medications or surgery, but most people give chiropractic a try after they've already tried these and they don't work," he said. "They may prevent the pain, but they won't solve the problem." The most important message, Lovetere said, is to inspire people to take action. Many patients will come into his office, and say they'd thought about trying chiropractic care and put it off or that they'd had a bad experience elsewhere. While it may seem hard to believe, or like a sort of miracle, "if it's done right, it will work," he said. "You're taking natural action, letting the body heal itself," he said. "There are no side effects. Give it a try." Duke Chiropractic has a "no-wait policy" for patients, Lovetere said. He offers family plans and will work with insurance companies to get patients the best possible coverage. Lovetere moved his business from Portsmouth to Greenland about two years ago. That's about the time he joined the Exeter Area Chamber of Commerce. "The Exeter chamber is unique," he said. "There is a lot of love and camaraderie." Lovetere said he joined the chamber because of the joy he gets from volunteering and giving back to the community. It's nice to be part of an organization that embraces that, he said. "It's such a giving group and it's so much fun to be involved," he said. November 25, 2010 2:00 AMGREENLAND - Around the holidays, some people need a helping hand, but others need a crutch. Crutches 4 Africa is a 5-year-old nonprofit organization that seeks to give those who barely can get around something to be thankful for. When a sufficient number of crutches are collected at drop-offs around the country, they are shipped to impoverished countries on the continent. The organization was founded by David Talbot, a polio survivor who contracted the disease just two weeks after Dr. Jonas Salk announced the creation of a vaccine to fight the crippling ailment. Working on a documentary in Uganda in 2005, Talbot watched as a woman used a branch as a sort of makeshift crutch so she could get around and resolved that he would help find a better way. Talbot presented a video about his experiences to the Hampton Rotary Club a few months ago, and that's where Dr. Duke Lovetere and others from the region discovered the program. He saw and heard about victims of polio, other diseases and accidents who use makeshift crutches or crawl along the ground just to get from place to place. The chiropractor said he came away with an immediate desire to collect the crutches at his office, and said it hit him particularly hard as a chiropractor to see it. "It really touched me, for a lot of reasons," he said. "If we're not able to ambulate a little bit, it throws our whole day off. These people, some of them literally can't move." Lovetere said the response from the community has been swift and generous. 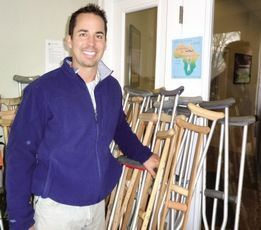 Earlier this week, he sent "dozens" of crutches out to be shipped to Africa, and he hopes that number will continue to ramp up as more people become aware of the program, especially because so many have old crutches in their attics or garages. "It just ends up in the landfill, and what's the point of that if somebody can benefit from it?" he said. GREENLAND - Anita Jordan never imagined that a chance meeting at an Exeter Area Chamber of Commerce event would change her son's life. Her son Brandan, 11, started having seizures when he was three days old and they never stopped. At one point he was having about 100 seizures and was taking more than 1,000 milligrams of medication every day. Along with the seizures, Brandan had challenges with his speech, as well as reading and writing. He was in the school nurse's office constantly. Jordan said she had tried what seemed like everything to help him over the years. "I spent thousands of dollars trying to get him better," she said. So, she admits that she was skeptical when Dr. Duke Lovetere approached her during a small business showcase hosted by the Exeter Area Chamber of Commerce last April, and told her he could help Brandan. Jordan was there because of her business, Jordan's Signature Heating, while Lovetere was there to showcase his business, Duke Chiropractic. Lovetere did a quick check the boy during the business event and immediately saw some issues he felt could be helped through chiropractic treatment. He noticed that one of Brandan's shoulders was lower than the other when he was standing. "He said, 'I'd really like you to bring him in because I can help him,"' Jordan recalled. The Exeter woman who had never been to a chiropractor before decided to give it a chance. Brandan went in to Lovetere's office in Greenland and had a series of X-rays done before treatment. Lovetere saw multiple spinal misalignments and issues that were causing pressure on Brandan's nerves, which he felt could be responsible for some of his health problems. Treating misalignments in a person's spine takes care of the cause of the problem and allows the body to heal itself, Lovetere said, rather than just medicating the symptoms. "It's a waste of time, it's a waste of money," Lovetere said of what he feels is a tendency to overmedicate people in today's society. Lovetere said he believes the current health care system focuses on treating diseases, rather than pro-actively supporting treatments that can promote good health. Good nutrition and chiropractic treatment can go a long way toward prevention of more serious problems, Lovetere said. Jordan, who had no prior experience with chiropractic adjustments, said she was scared out of her mind when she heard the cracking associated with the treatment that first day. "Dr. Duke's like a Kung Fu master on this kid's neck," she said, adding she heard some loud cracks before Brandan got up and said, "I feel good." After the first two visits, Brandon stopped having dizzy spells. He had more energy and stopped going to the nurse's office all the time. The physical therapist who worked with Brandan three to four times a week during the school year saw improvements as well. His speech improved. His handwriting started to get better. But most amazing to his mother was that he stopped having seizures. "You wouldn't believe it unless you saw it yourself," Jordan said. "He's been seizure free since April." Jordan took her son to his regular pediatric neurologist at Dartmouth Hitchcock Medical Center after the seizures stopped to find out about cutting back on the amount of medications he took. The neurologist told her he couldn't explain what had happened with Brandan, but that whatever they were doing was working and to keep it up. Brandan's medications were slowly decreased and he now takes only 150 milligrams per day. Lovetere treats other children in his practice as well and said chiropractic treatment can help with ear infections, sinus issues, and digestive problems and especially in children with autism. 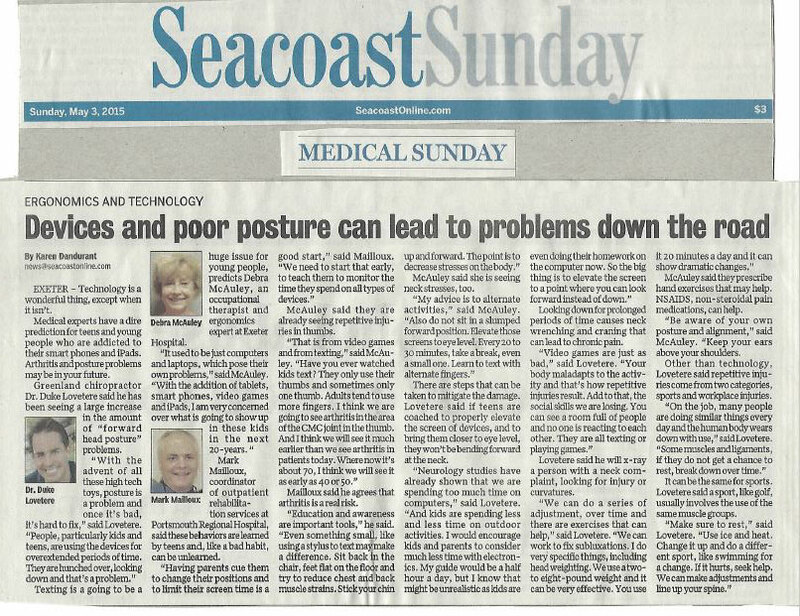 "Chiropractic's almost too simple for people; it works almost too well," Lovetere said. As a result of Brandan's amazing improvement, Jordan has become an ardent supporter of chiropractic treatment. "If you have a child with a disability, it is worth trying, it's worth checking into," she said. "It might not be a miracle for everybody, but, wow, the changes in Brandan have made it worthwhile." To encourage other parents to try chiropractic, Jordan and Lovetere have teamed up with a special program that will also benefit the Exeter Area Chamber of Commerce Children's Fund. For every child who gets a chiropractic evaluation with Lovetere in the next two weeks, they will donate $10 toward the Chamber Children's Fund. Office hours: 8 a.m. to noon, 3 to 5:45 p.m. on Monday, Wednesday and Thursday; 3 to 5:45 p.m. on Tuesday and the office is closed Friday, Saturday and Sunday. FREE CONSULTATION FOR ALL NEW PATIENTS! MENTION THIS AD. Sign up using the form below or call us at 603-422-0432. "Look what our friends on Facebook have been saying about us! "First chiropractic experience and they're AWESOME, after three sessions able to run and not be in pain afterwards. Absolutely worth it!" "Super friendly and helpful! I went in for some back pain and Dr. Duke and the team have been working very hard to sort me out! I would recommend their services to anyone!" "Duke family chiropractic is excellent. The staff there are super friendly and make you feel welcome. I've been going three months now, twice a week to get adjusted. My back and neck feel a whole lot better and pain free. 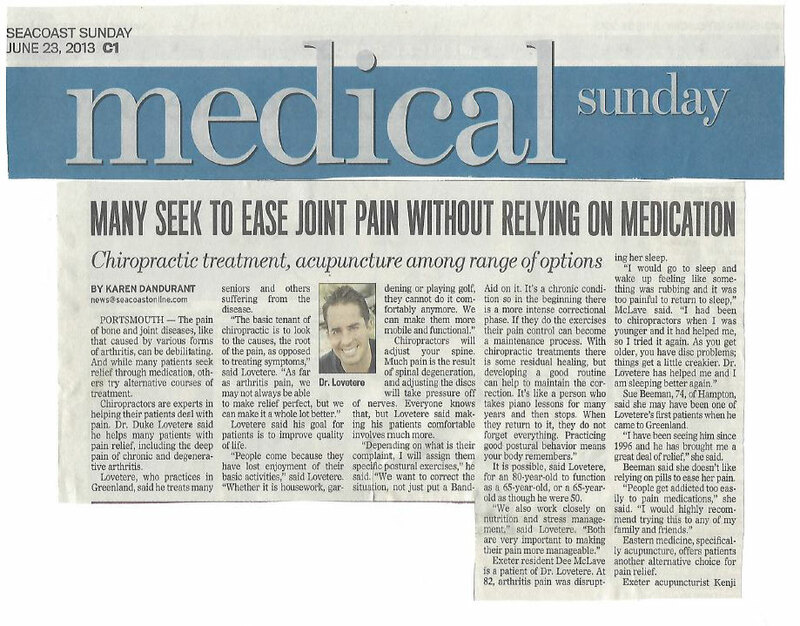 I would recommend them to anyone who going through any pain." Want to see more, visit us on Facebook!